Greetings from Munising, Michigan. It is my pleasure to present these images to you via 'the web'. My photographic interests are quite varied and include outdoor and nature, lighthouses of the Great Lakes, and sports. The galleries are being updated frequently so check back often. Check out the "Nature" or "Architecture" galleries which may be of interest to you. 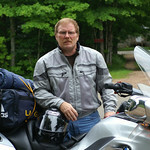 Or check out the Motorcycle Travel and Videos page. The galleries are quite easy to navigate through. If you are interested in purchasing images, the 'buy' tools are very easy to use. You are also welcome to just browse. My current camera is the Sony a77 with a variety of lenses and accessories. I have been blessed to live in one of the Midwest's premier regions for outdoor and nature photography. Feel free to contact me for information related to fall color, lighthouses of the region or waterfalls.